All week, we’ll focus on reference librarians at the National Library of Medicine. 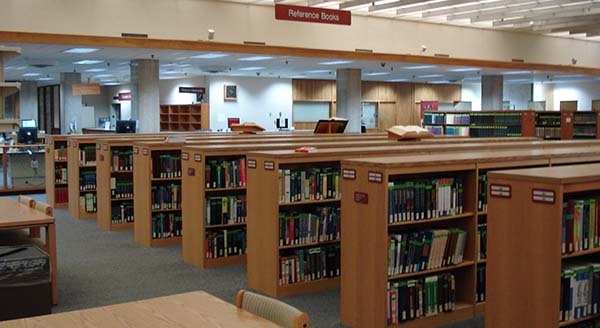 Today, we’ll cover what reference librarians do and what makes them unique at NLM. On Tuesday, Wednesday, and Thursday, we’ll introduce you to three reference librarians at NLM. They’re all passionate in their pursuit of making health and medical information more available and helping the public. But their career paths couldn’t be more different. One figured at this point in his career, he might have been managing a chain of restaurants. Another knew in college that a career in library science was the ideal path for him. And the third only considered a career as a medical librarian when a health crisis struck home. Then on Friday, we’ll share some of the more unusual questions that reference librarians at NLM have received—and how they were answered. Terry Ahmed (L), head of the Reference and Web Services Section, in the Library’s Reading Room. “Our reference librarians are the face and voice of the Library,” said Terry Ahmed, head of the Reference and Web Services Section. The public has a lot of questions for NLM’s reference librarians on the campus of NIH in Bethesda. Calls for help come in by phone, email, social media, and visits to the Library. “We’re different from other biomedical libraries based on the large volume of requests we receive. Last year, we received more than 93,000 questions, including 5,000 onsite questions. We also support the Library’s products and services, which makes us unique,” explained Wanda Whitney, reference librarian. Questions to NLM come from health professionals, librarians, NLM staff, consumers, clinicians, researchers, news media, Congress, and occasionally even the White House. Some requests can be answered quickly. Others require a bit of digging. The most popular NLM resource is PubMed. The second most heavily used resource is MedlinePlus.gov. apply business analytics techniques to improve the NLM customer service experience. “Our reference librarians help manage the customer service gateway to the public, providing valuable feedback to various NLM program areas,” says Ahmed. They are the face and voice of the Library. March 27, 2017 in Programs & Services.